The four new Sublime books that we’ve been eagerly anticipating have arrived! The patterns in these books use the gorgeous Merino Silk Dk, Baby Cotton Kapok Dk, and the Organic Merino Wool Dk. The first book is The Fifth Sublime Aran Hand Knit Book. With 14 sumptuous aran designs for women, men, boys, and girls, it’s sure to be a hit with everyone in your family! This book has a hint of military styling while using textured layers. 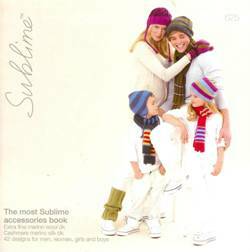 The most Sublime accessories Book has 42 quick and stylish accessories from scarves and hats, to socks and capes. The “ice queen cape” has just gone on our “to do” list! Next up is The Fifth Little Sublime Hand Knit Book. These designs are for newborns to 3 year olds. Quick and easy knits that everyone will be “oohing and ahhing” over! Why not try out your first cables on a little cabled beret? 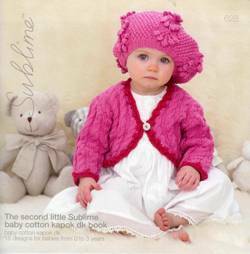 And last but not least, another adorable baby collection: The second Baby Kapok Dk Book. Kapok is an extremely comfortable fibre for babies to wear, and has a unique quality that is perfect for staying warm in the winter and cool in the summer. 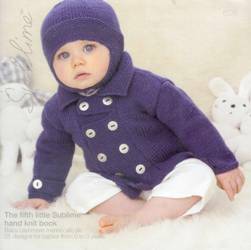 Taking inspiration from the 50’s with vintage bonnets and classic cardigans, this book is a must see for soon-to-be Grandparents! Stop by either store to take a look at this fabulous collection of books! This entry was posted on Friday, August 14th, 2009 at 10:20 am	and is filed under Uncategorized. You can follow any responses to this entry through the RSS 2.0 feed. Both comments and pings are currently closed.